The temperature stayed in the low 20's most of Thursday although I'd hoped it would warm up a little more by noon. JQ was not able to join me so I headed out alone to Central Park, ducking through buildings along the way to keep warm. The wind and cold were brutal but the sun was shining and I knew that I'd be fine once I got going on my run. 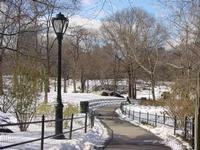 I reached the Park, that was covered white with snow, and began to follow my usual course. I started with the lower loop and ran counter-clockwise, east then north. There were only a few others along the path: an occasional cyclist, a few other runners and a handful of freezing tourists. I kept my pace brisk in an effort to heat up quickly and it worked. By the first mile I had become comfortable with the weather but I struggled a little with the hills. It's been a while since I've run with any real course elevation because most of my running this year has either been on the treadmill or on the basically flat roads within my neighborhood. I ultimately did fine with the hills and managed to maintain my pace. Before long I had passed 3 miles and was nearing my end-point when a tall runner, wearing black compression gear from head to toe, passed me like I was standing still. I was actually moving fast (for me) at the time, maintaining about an 8:30 pace. Overall, I averaged 8:46 per mile, helped along by the freezing but energizing wind. I finished hot and sweating but by the time I returned to my office I was cold and dry again. This morning I planned for an easy run on the treadmill. I had a late start and felt I'd gotten some good speed work in yesterday. My first mile was slow -- just below 10 min per mile, and I didn't even need to turn on the treadmill's cooling fan until ten minutes into my run. I stepped up the speed from there and ran the second 1.3 miles closer to a 9:00 pace. My "easy" run turned out to be a little harder than planned but it felt good. I cannot maintain a slower than normal pace on the treadmill because the numbers on the display taunt me to run faster. That's okay, at least the first mile was easy.